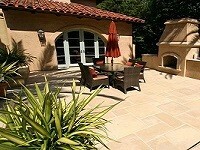 The beauty of natural stone in durable, low-maintenance porcelain. texture and warmth underfoot for a spa-like appeal. an eye-catching, high-end shower look for less. Durable, low-maintenance, natural stone inspired beauty for baths. The warmth and texture of wood engineered for water resistance. Provides a clean and classic look with timeless appeal. A shimmering, attention-grabbing addition to any bath. A pop of sparkle and color that makes a splashy statement. What should be your bathroom be like? Everybody have their choices so have you and Westside tile is here to help you. We provide a huge range of stylish bathroom tiles for your desired bathroom. Choosing the perfect tiles to match your bathroom project is easy with our selection of tile designs, colors, size, finishes and quality materials that transform your bathroom into your dream space. Our shop features the work of professionals like Alyse Edwards, Artistic Tile, Villeroy & Boch and Voguebay. 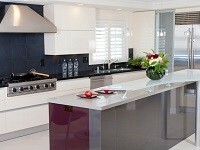 We offer their design collection at affordable prices. We have the in-decor specialists who help to choose right choice of bathroom tile and provide various bathroom wall and floor tile ideas that go with the latest bathroom trends. Whether you are planning for new or remodeling your bathroom, Westside Tile and Stone Inc. has everything from traditional designs and textures to the modern contemporary designs, to give your bathroom a look you are looking for. The main advantage of choosing a tile in your bathroom is that it won’t get damaged easily when comes in contact with water. Tiles are frost resistance in nature and the perfect choice for the wet rooms and high humidity areas like bathrooms. Tiles are also resistant to fire as compare to other finishes like wood. Tiles are suitable for bathroom walls and floors or home finishing as it is very easy to clean and bacteria free too. Tiles add value to the bathroom or any section of the home and that too in almost no maintenance, it costs less than other long-use flooring options. If properly selected and installed, Tiles provides more durability and lasts longer than other bathroom flooring options. Our huge variation in bathroom tiles offers a countless number of designs, colors, textures, shapes, and styles to create custom creations. Tiles are perfect for the outdoor bathrooms, as the color of tile does not fade in sunlight like the dyes used in other floor finishes. When you are looking for sensible bathroom flooring or stylish shower tiles, Westside tile will have an available variety of tiles to give your home the desired effect of color, texture and pattern combination. Explore our regularly updated ranges of tiles that go with the latest trends and you can achieve everything from a modern and modern-day artistic to pastoral and homely looks with easy. Natural stone has long been used as a surfacing material for bathroom walls and floors due to its elegance and beauty which comes along with high durability, as compared to other tiles it is a variety of mountain-born mineral. Substances and common natural stone flooring include slate, marble, limestone, granite, and sandstone. Sandstone is the most porous, while granite is more waterproof. Travertine, limestone, and slate have medium permeable. Get inspired by our classic unique design and a fantastic range of traditional bathroom tiles that really invoke a time long passed. If you are planning to achieve a traditional bathroom design with a beautiful roll top bath we have a wide range of traditional bathroom wall tiles and bathroom floor tiles for you. The White color is something which can never be out of fashion. A White color gives an elegant and lavish look to the bathroom; we mostly recommend these tiles to small size bathroom because of its broad approaching despite the fact that it can suit master bathrooms too. A modern bathroom is all about creativity and tries something out of the ordinary. The more colors of tile you chose it will give a modern look to the house. You can also choose large size tiles to give partition between wet and dry area. Our bathroom tile store offers a wide range of latest designs with innovative textures and design to give your bathroom a unique look. If you are thinking to remodel the bathroom area, firstly make a clear layout of your bathroom and now give it a thought what kind of change you want in there. We have a very large variety of bathroom tiles to suit all styles and tastes, we make sure tiles you choose, will be available to you on time. We provide a wide range of styles in Bathroom tiles like classic marble bathroom tiles or a chic bathroom floor. Add the perfect stylish touch to a bathroom with a classic stone look or the soft reflective tones of our exquisite bathroom tile collection. We provide a wide range of Bathroom tile patterns, used for both residential and commercial applications and is available in various sizes, shapes, and designs like, porcelain tile in combination with glass, travertine tile with glass mosaic or mosaic artistic tile, white subway tile shop bathroom, contemporary bathroom with glass mosaic, ceramic tile in wood style, porcelain glass mosaic tiles, porcelain tile pebble floor, and many more. 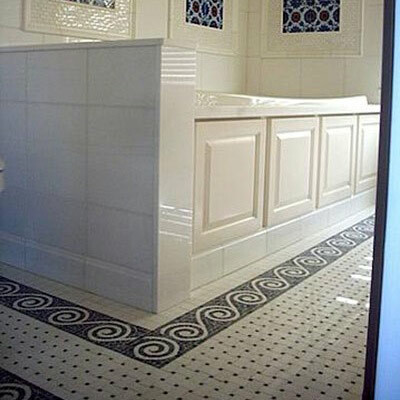 Our Bathroom tile store offers a wide variety of tile patterns that no other tile contractor have. Hexagonal tiles, a unique pattern in trend these days, we offer with various sizes, colors, and finishes to choose from. Octagonal tiles have recently become one of the popular tile patterns and Large Format tile pattern, ideal for creating a spacious look in the bathroom. When it comes to bathroom wall panels and shower wall panels, brick effect panels as well as rust-like effect are popular tile effect panels and are easy to install, hard wearing and long lasting. 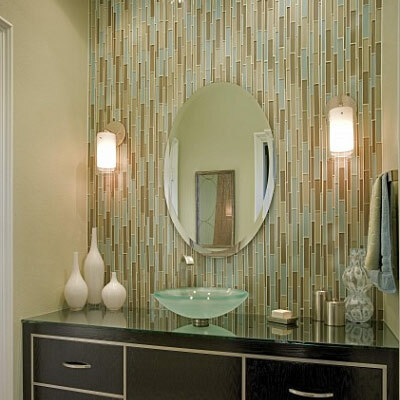 When combined with a pale-colored wall or gloss tile finishing, it will add a powerful look to bathroom walls. Tiles can be made of various kinds of materials which include natural stones, glass, and metal. 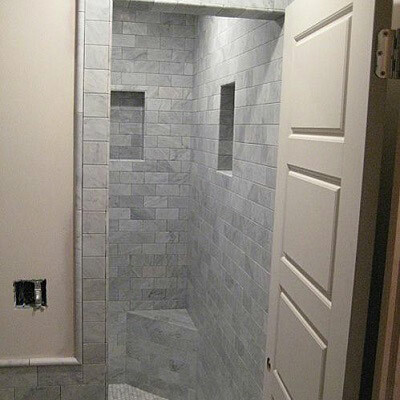 Westside Tile and Stone, Inc. provides a wide variation in colors, shapes, sizes, and finishes, when it comes to choosing a material for your bathroom tiles. Tiles can be made of various kinds of materials which include natural stones, glass, and metal. In these tiles, Ceramic bathroom tiles are most commonly used. Ceramic tiles look like it is far back from Roman Empire. Selecting ceramic tiles are both practical and decorative. Not only it is the cheapest tile option but ceramic tile is also durable, moisture and bacteria free and it is easy to clean. Ceramic tiles are full of textures, shapes, and colors to give you huge options which tile to be chosen. 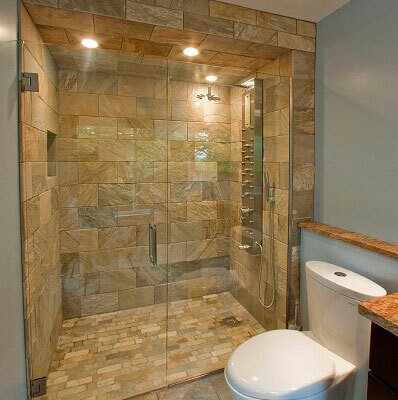 Another choice of selecting tiles for bathroom area is travertine tile. Travertine Bathroom Tiles are known for its porous nature but it is not a big deal if it is sealed with suitable sealer then it can be used in the wet area also like shower area. Its appearance makes it eye-catching not only because of its beauty but also for its simple maintenance. When we talk about most durable bathroom tile, limestone tile secure the first place. Graced with natural beauty, Limestone bathroom tiles are very easy to clean and maintain limestone is a sedimentary rock composed largely of the calcite and aragonite with the other material such as quartz, feldspar, clay minerals, and siderite. 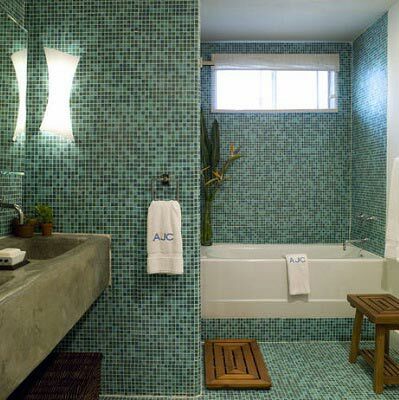 Showers, cabinet, and walls can be covered with it to add a look of hotels to your bathrooms. 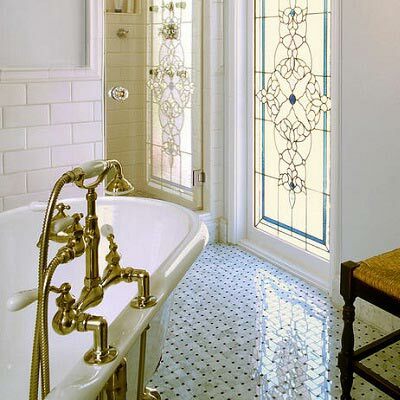 Glass tile is something which gives a bathroom an authentic look. Glass bathroom tiles provide a craze in people that cannot be fade easily. Its quality and selection have widely increased in the last few years. The large format glass tile gives a very royal and classic look. Whether it is backsplash, shower, wall or partition various varieties of glass tiles are available on our Westside tile store. Porcelain tile is denser and less porous. It offers very less stain and water resistance as compared to ceramic tile. Porcelain bathroom tiles are suitable for radiant in-floor heat to keep feet warm or cool mornings. Two types of porcelain tiles are available in our store and they are through bodied. These are strong but have no glaze. The other option is glazed porcelain tile which is completely covered with a wear layer or hard finish that is typically colored. Granite is formed under very high heat and has a crystalline structure. Granite Tile is quite intense with potency similar to porcelain. One of the best parts of granite bathroom tiles is that space between two tiles doesn’t appear and it looks like a complete plate. 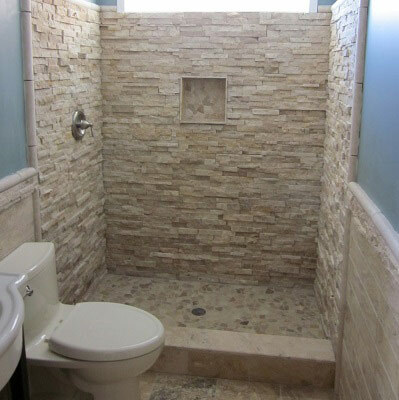 Westside tile and stone Inc. provides the best service in dealing with bathroom tiles in Southern California. We have recently introduced to our customers its new range of bathroom tiles. Proudly serving as the best tile store in the greater Los Angeles area, we are committed to providing the latest bathroom tile materials and it’s fine-looking designs. 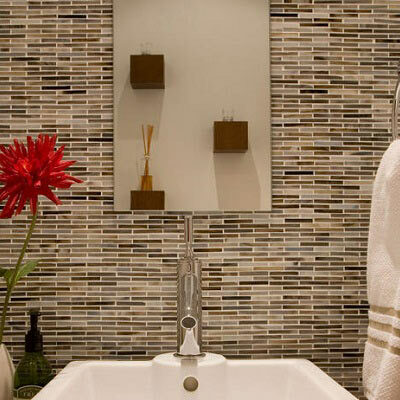 While planning for restyling of your bathroom area, keep us considering the best tile options. We assure you the complete satisfaction. Go and connect with Westside bathroom tile store near you.